We live in a Demolition Control Precinct and the residents in our street have very strong opinions about protecting the existing dwellings, most of which were constructed pre-1946 or pre war. The intent of the Demolition Code is to maintain the character of the pre-war streetscapes by controlling demolition, relocation and removal of buildings that contribute to the traditional character of the street or area. Sometimes, however, demolition protections are not enough to save some of these houses. People can and do find loopholes in local laws. After a long and hard battle with Council this worker's cottage was permitted to be demolished and a new double-story house is now being constructed in it's place. The 2nd story is yet to go up. Nice view of a block wall! I imagine the occupants of the house next door are now feeling a little hemmed in. Living on a small lot with a 1m setback can present all kinds of issues such as overshadowing, loss of natural light and privacy. Is there a price for this loss of amenity? All of a sudden living next to a block of units doesn't seem so unappealing. I wish that historical preservation societies were more prominent and had more power in Brisbane. I hope that they are at least recycling all the old timbers and windows. The whole DCP thing is a joke and I'm convinced you can do anything depending how deep your pockets are! It is disgraceful that pre-1946 homes can be demolished. Meanwhile, we are attempting to reinstate the original character features of our home, enclose our verandah which was originally enclosed, repair our baludstrades and relocate our front stairs and yet this has been deemed unacceptable by town planners and we have had to endure a risk-smart application, setback relaxation, town planning application and partial demolition application along with all the associated fees! 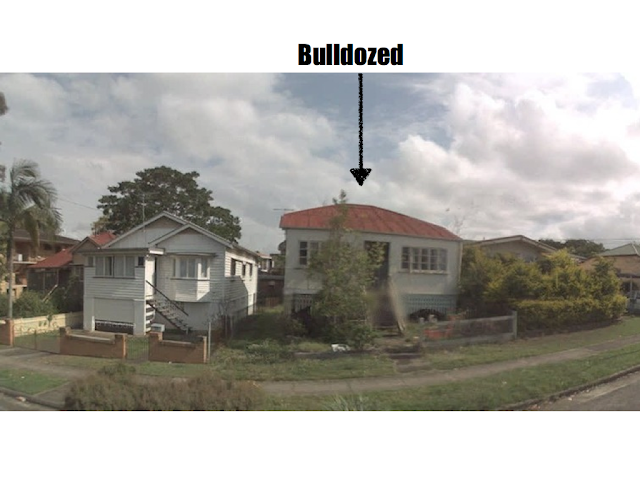 Do you notice it's usually the "uglier" worker's cottages that are the first to be dozed. We need to keep a diverse range of homes, it's our state's history. We are happy to have saved (for the time being) two house that fit the usual demolish mentality. Appalling and incomprehensible, I agree. But everyone doesn't share our views - a while ago I had this rather pointless and badly-worded exchange on a real estate agent's blog, with people (including the agent) arguing that our pathetic heritage protection legislation had gone "too far". But - if you understand the underlying driver for their arguments (profit) it all becomes a bit clearer.